These Pet Rescue level 366 cheats and tips will help you beat level 366 of Pet Rescue. 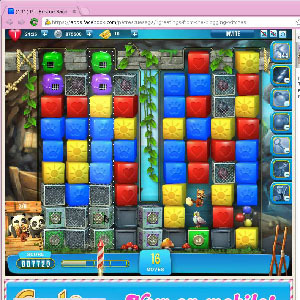 The objective of Pet Rescue level 366 is to save 9 pets and get 10,000 points in 30 moves. There are two distinct sides in Pet Rescue Saga level 366. Each one needs to be dealt with separately. Concentrate your efforts on one side first, then the other. If you divide your attention between two strategies from the beginning, you are less likely to succeed. This is one time multitasking won’t help. The column blaster will actually play a supporting role in this level. You can use it to perform surgical strikes on certain cages that are holding you back. Cages that you should destroy in particular are those surrounding bombs and colored blocks. Bombs are your highest priority to free. When you have a bomb out of its mesh cage, work on dropping it to the bottom of the level so you can use it for great destruction. Bombs can also be used to destroy a great number of mesh cages. Once those are gone, concentrate on using the bombs to quickly drop pets out of the board.